Unfortunately the following tale about Mike Gleeson and Sarah Corcoran is the only story involving a GLEESON that my father related to me late in his long life. But I feel privileged to be able to share it here, and have it recorded for our future descendants. 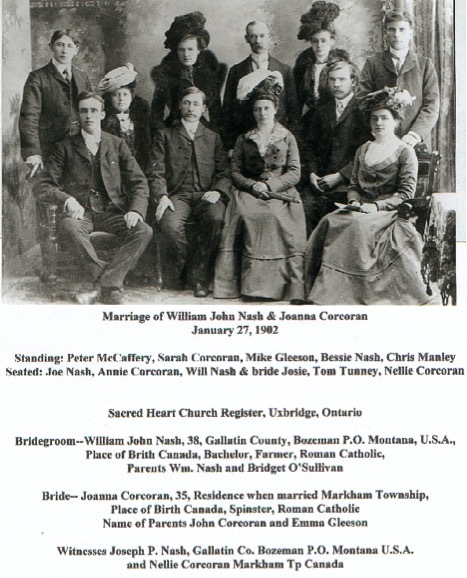 This is our only picture of Mike Gleeson [1852-1906], with family at the wedding of my Dad’s Uncle Willie Nash and Aunt Josie Corcoran in Uxbridge, Ontario, Canada in 1902. Uncle Willie had been the first to venture to Montana in search of rich farmland in the 1887, and his younger brother Pete, my grandfather, soon joined him here to claim separate homesteads near the Gallatin River at the foot of the Rocky Mountains. Plentiful irrigation water flowed from these mountain slopes and the young men proved up on their 160-acre farms after five years. 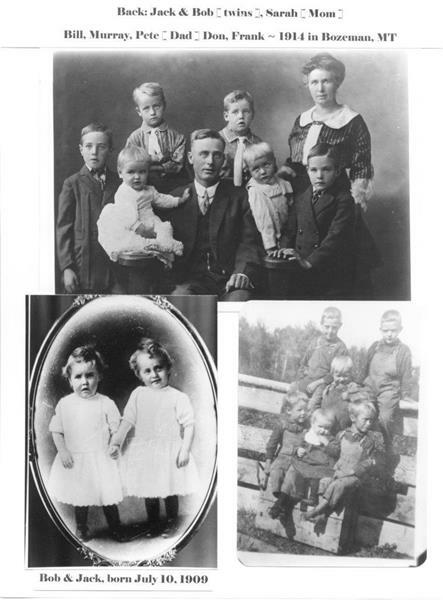 The homesteaders’ entire family of William Nash III & Bridget O’Sullivan and nine children had immigrated to Bozeman, Montana from Ontario and became US citizens here by 1900. Pete & Will eventually settled closer to the mountains, south of Bozeman. Pete was renowned for his successful farm and ranching. It seems that young women were in short supply in the Montana territory, so Uncle Willie found his partner back in Canada in Miss Joanna Corcoran, the oldest daughter of John Corcoran and Emma “Ellen” Gleeson. 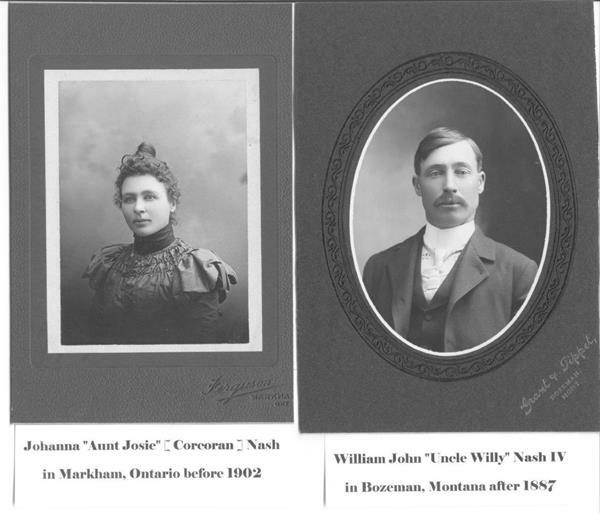 In 1904, Pete Nash was married to Joanna’s younger sister Sarah Corcoran in Bozeman, Montana. 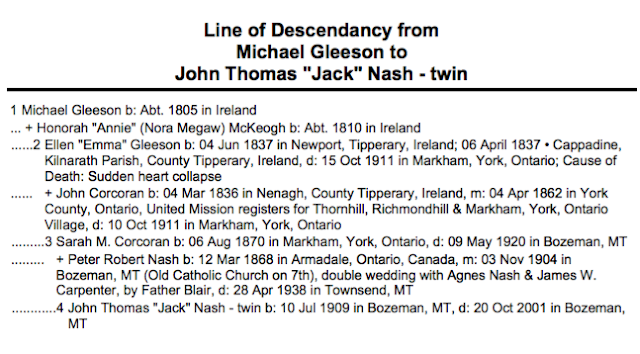 Uncle Willie and Aunt Josie had no children, but Pete & Sarah had 6 sons before Sarah died in 1920 of pneumonia, relating the story of Mike Gleeson to my young father, Jack Nash, who was born in 1909 and lived until 2001 within ½ mile of his birth on the Nash Home Place. 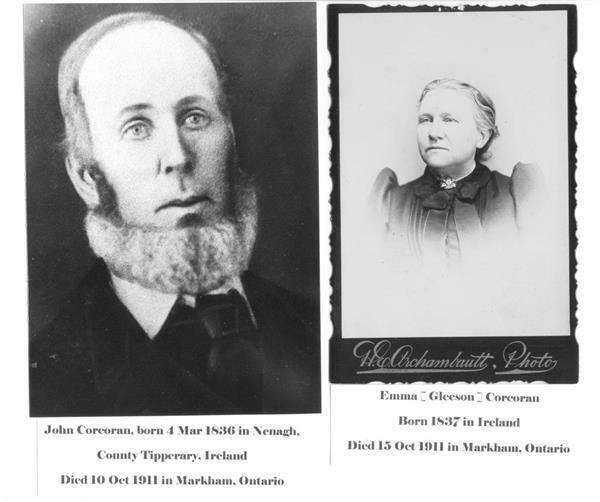 The four Corcoran daughters (pictured in the first picture above) were seamstresses in Canada: Joanna, Sarah, Annie, and Nellie. They seemed to have wonderful clothes and hats for the time! 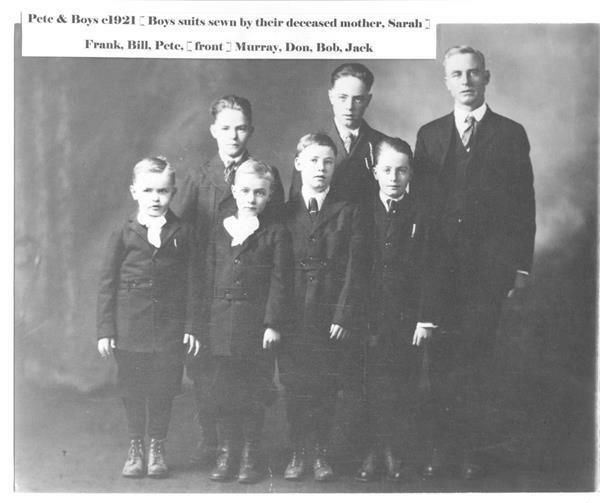 Sarah had made suits for all of her sons before dying in 1920. Mary was the fifth Corcoran daughter, married to John Joseph Kennedy in 1898, and there were no sons. I do not know the relationship of Peter McCaffery, but Mike Gleeson was said to be a cousin. Morty Gleeson was Mike’s father, and the baptismal sponsor for Sarah Corcoran in 1870. Others pictured were Chris Manley who was married to Nellie in 1904, and Tom Tunney who was married to Annie Corcoran by 1901. Joe Nash and Bessie were siblings of Uncle Willie. Finally, the oral “story” I heard was that young Sarah, the grandmother that I never knew, was involved in house cleaning for Morty Gleeson and his wife, Anna Ryan near Markham, York County, Ontario. When Sarah was dusting the mantle on the fireplace, a valuable vase flew off and was shattered. When his parents arrived home shortly, Mike blurted out: “Look what that darned cat did!” I think it was left at that, and probably no harm was done by this tale. Mike was a single cousin, somewhat older than the Corcoran girls, and was admired by them. I believe that he had no offspring, but it is nice to have this story of comradery to share about our Gleeson heritage. Thank you Liz and Maurice, what a wonderful story, complete with those great old pictures! There's quite a resemblance among Sarah's sons.